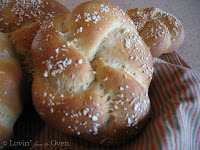 Frieda Loves Bread: The Best Hamburger Buns! 2 The Best Hamburger Buns! A good friend of mine asked me, "Want to taste the best hamburger ever?" Now, I am not usually a beef gal (I prefer chicken), but I had to take her up on her offer. She took me to a quaint cafe (sadly, it is no longer operating) that used fresh, organic ingredients. I had to say, I was impressed. Not only by the lean, moist beef, but by the all wheat bun! It was truly love at first sight and taste! I used the Feather Wheat Roll recipe and made 12 beautiful looking hamburger buns, using the rosette style of shaping, and flattening them with the palm of my hand. I am not sure what other bakers top their rolls with (sesame seed or wheat flakes), but I spritzed the tops with water, and sprinkled them with chopped oatmeal. These look great. I am wondering how the top holds up when juicy toppings are applied?